"The scream you hear may be your own!" It was one of the first female stalker films, an early precursor to Fatal Attraction (1987). Garver: I just don't know what to say to you. Evelyn: I'm sorry I mistrusted you. I should've known you'd never do anything to spoil it. Evelyn: What we have between us. Garver: We don't have a god-damn thing between us. Now how many ways am I gonna have to say this to you? Evelyn: I don't care how many ways you have to say it, it's not true! Garver: What do I have to do to convince you? Evelyn: It's not true! It's not. Evelyn becomes angry and jealous and feels abandoned. She attempts suicide by slitting her wrists. She knifes his cleaning woman and destroys his possessions, and as a result, is put away in a mental institution. When she is later released, Evelyn resumes her nightly requests for Misty. She promises Dave that she is cured, but becomes especially crazed when he resumes his relationship with blonde ex-girlfriend Tobie Williams (Donna Mills). 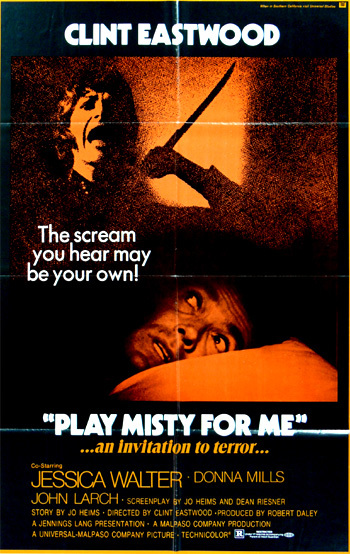 In a horrifying scene, Garver is awakened in the middle of the night in his bedroom to the sounds of 'Misty' being played. Evelyn, now a possessive, obsessive, murderous psychotic stalker, appears above him with a butcher knife ready to stab him - and she stabs his pillow. He evades her, saving his life, but she escapes. Careful, I might put your eye out. I'll bet David loves your eyes. And your hair. Does he run his fingers through your hair? Have to get you all nice for David. For David. I hope he likes what he sees when he walks in here, because that's what he's taking to Hell with him. During a truly scary, knife-wielding confrontation, Dave finds Tobie bound and gagged on a bed. He is again attacked and badly wounded by Evelyn. After being slashed many times, he punches her in the jaw, sending her through the balcony window to her death, down a rocky cliff and into the ocean below. And now here's a pretty one for lonely lovers on a cool, cool night. It's the great Erroll Garner classic, Misty. And this one is especially for Evelyn.